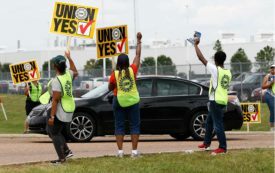 Members of UAW Local 42 want collective bargaining rights at the Volkswagen plant. Where better to debate about labor rights, unions and the future of work? The post The Presidential Candidates Should Debate Union Rights in Chattanooga appeared first on The Nation.